As an investment, we do not favor gold and silver over US stocks or US stocks over gold and silver, but rather we believe that all investments are cyclical and that recognizing and investing in the long term trend is the key. However, in our opinion bypassing the distorting effects of inflation for a clearer perspective of the markets real performance is the secret. 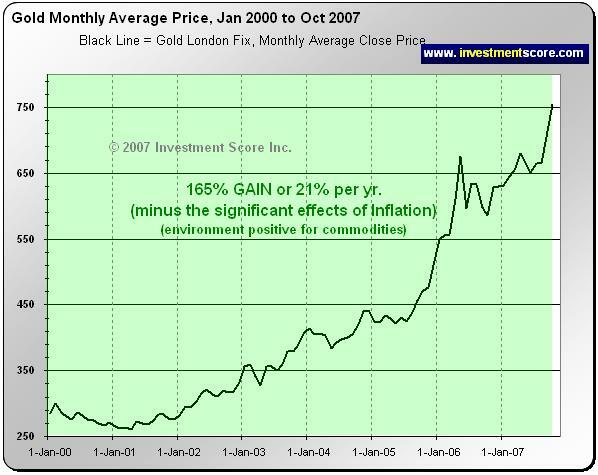 It is our assumption that most investors reading this article are interested in investing in gold or silver for whatever reason. It is also our assumption that many of these same readers have experienced negative feedback from friends, family and colleagues for their decision to do so. Why? What are these other investors missing? Why do investors seem to be so emotionally attached to the US stock markets while having such a negative, close minded attitude towards gold or silver as a potential investment? Understanding this can not only give us insight into their thought process and therefore give us the potential to possibly help them, but this knowledge can also help us gain confidence in our own decisions; those that we believe will lead us to our goal of profit. Unfortunately most investors put too much emphasis on their recent personal experiences and not enough emphasis on historical data. In our opinion it is human nature for people to want to “stick with what works” and as a result they are very resistant to change. Because investors have recently experienced the emotional ‘highs' of the US stock markets bull run from 1980 to 2000 they have a natural resistance to change; the result is that they oppose the idea that stocks were not a very good investment during the 2000 to 2007 period. Interestingly, these same investors who state “…you can't argue with performance” are much closer to understanding our position than they realize. It is our belief that they base their decision from the overall investment returns of 1980 to 2007, in which case their argument is valid. However, please observe the following charts carefully for another perspective. We do not believe one investment asset class is the ultimate winner that should be considered the best investment class over all others. We think this is a fault in the way investments are commonly analyzed . The question is not, “what is the ultimate investment of all time?”, but rather “what is the best investment class for this market environment over the next ten or twenty years”? 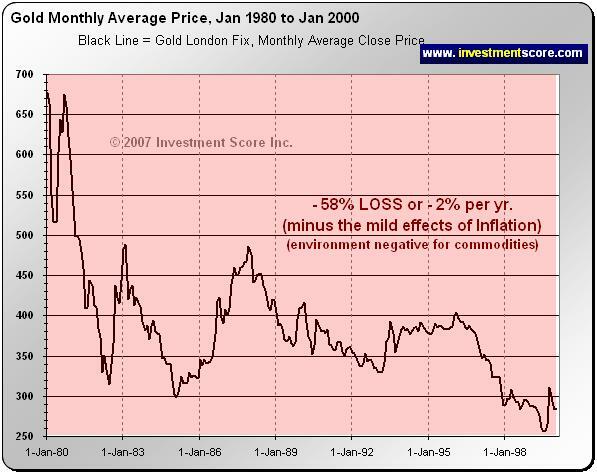 We believe that this is the major misunderstanding for most US stock market and gold bulls. 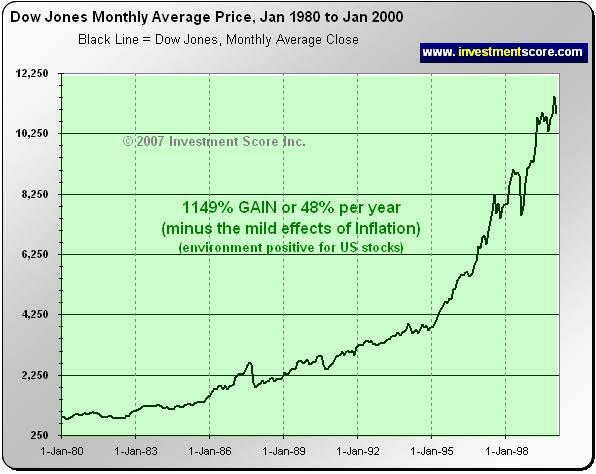 As you can see market conditions do change, and investments are cyclical. We do not advocate owning metals through all market conditions just as we don't advocate owning stocks through all market conditions. 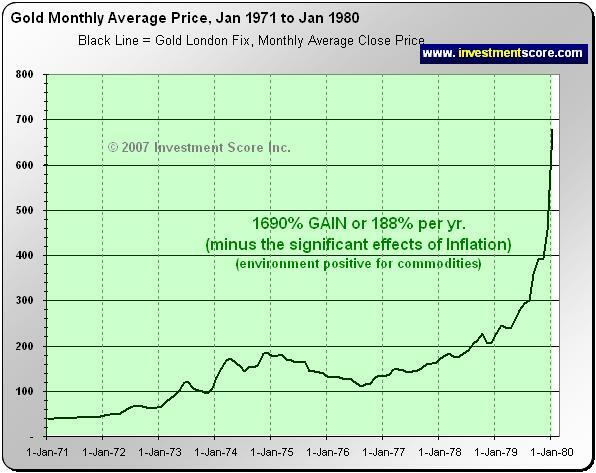 From 1970 to 1980 it made sense to own commodities, from 1980 to 2000 it made sense to own US stocks and from 2000 to 2007 it has made sense to own commodities again. But are we in a major long term bull market trend in commodities where an early investor can hope to make quadruple digit returns over the long term? 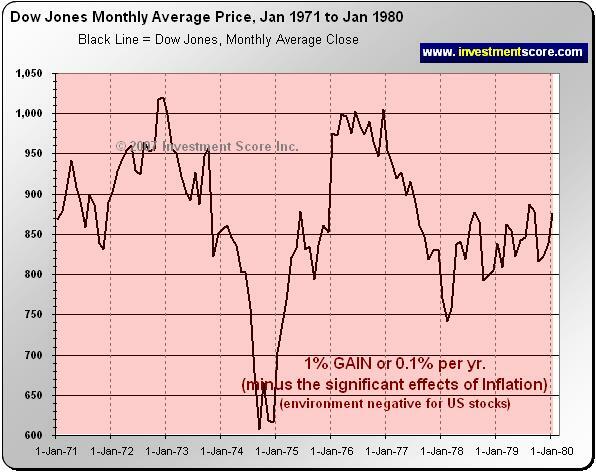 Unfortunately the challenge in locating these long term trends is finding a way to bypass the distortion that inflation has on the markets, which in our opinion masks the severity of real corrections in US stocks. 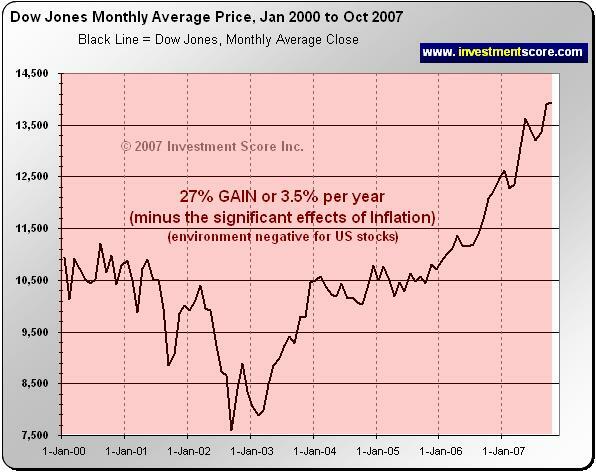 It is our opinion that since 2000 US stocks have generally been a very poor investment when adjusted for “real” inflation. Just because the numbers of a market is increasing does not mean an investor is making a “real return” on their investment. We believe that one must always consider all elements of a market, including what is happening to the value of the measuring stick of that market. This is the basis of our analysis at our website and a topic for another time. In our opinion the argument that investors can not “time” the market is a flawed assumption but that is also a discussion for another time. Investors who are interested in some common sense insight to the financial markets can visit us at www.investmentscore.com . Here you may also subscribe to our free newsletter and learn more about our strategies. Finally, if you think this commentary could help someone you know, please do not hesitate to forward a link of this article to them. Thank you. Investmentscore.com is the home of the Investment Scoring & Timing Newsletter. Through our custom built, Scoring and Timing Charts , we offer a one of a kind perspective on the markets. Our newsletter service was founded on revolutionary insight yet simple principles. Our contrarian views help us remain focused on locating undervalued assets based on major macro market moves. Instead of comparing a single market to a continuously moving currency, we directly compare multiple major markets to one another. We expect this direct market to market comparison will help us locate the beginning and end of major bull markets and thereby capitalize on the largest, most profitable trades. We pride ourselves on cutting through the "noise" of popular opinion, media hype, investing myths, standard over used analysis tools and other distractions and try to offer a unique, clear perspective for investing. Disclaimer: No content provided as part of the Investment Score Inc. information constitutes a recommendation that any particular security, portfolio of securities, transaction or investment strategy is suitable for any specific person. None of the information providers, including the staff of Investment Score Inc. or their affiliates will advise you personally concerning the nature, potential, value or suitability or any particular security, portfolio of securities, transaction, investment strategy or other matter. Investment Score Inc. its officers, directors, employees, affiliates, suppliers, advertisers and agents may or may not own precious metals investments at any given time. To the extent any of the content published as part of the Investment Score Inc. information may be deemed to be investment advice, such information is impersonal and not tailored to the investment needs of any specific person. Investment Score Inc. does not claim any of the information provided is complete, absolute and/or exact. Investment Score Inc. its officers, directors, employees, affiliates, suppliers, advertisers and agents are not qualified investment advisers. It is recommended investors conduct their own due diligence on any investment including seeking professional advice from a certified investment adviser before entering into any transaction. The performance data is supplied by sources believed to be reliable, that the calculations herein are made using such data, and that such calculations are not guaranteed by these sources, the information providers, or any other person or entity, and may not be complete. From time to time, reference may be made in our information materials to prior articles and opinions we have provided. These references may be selective, may reference only a portion of an article or recommendation, and are likely not to be current. As markets change continuously, previously provided information and data may not be current and should not be relied upon.